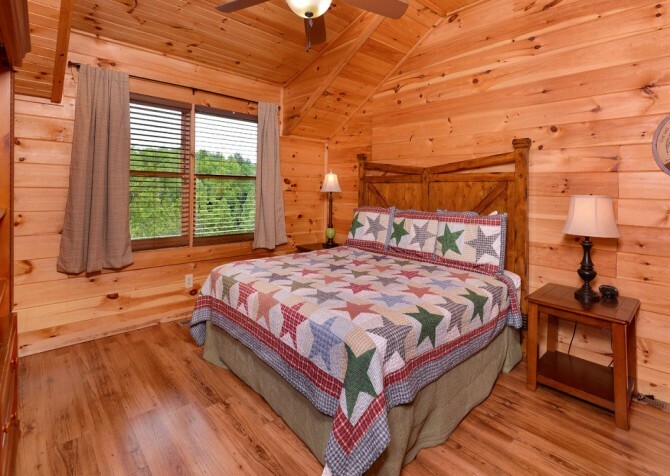 Perfect for a group of couples, a small family, or even honeymooners, this gorgeous 2-bedroom, 2 ½-bathroom cabin in the Cedar Falls resort offers a great location and amenities to make everyone’s vacation a memorable one. 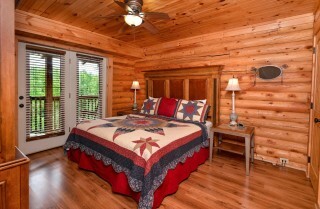 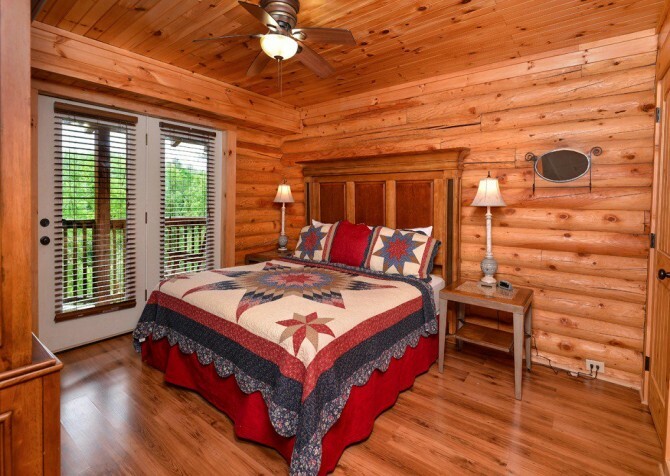 Located 8 miles west of Pigeon Forge, this 2-level cabin is close enough to let you explore downtown Pigeon Forge while still giving you those peaceful tree-studded surroundings you long for on a Smoky Mountain getaway. 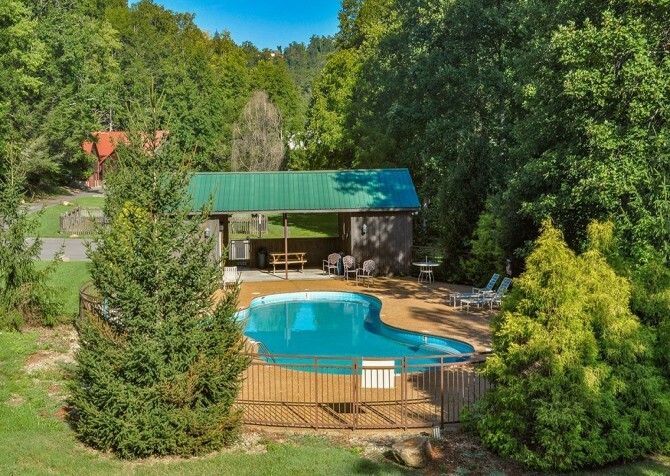 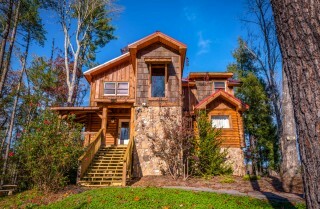 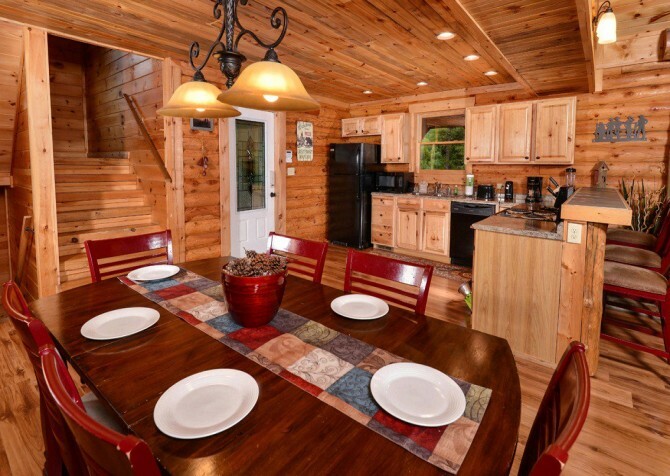 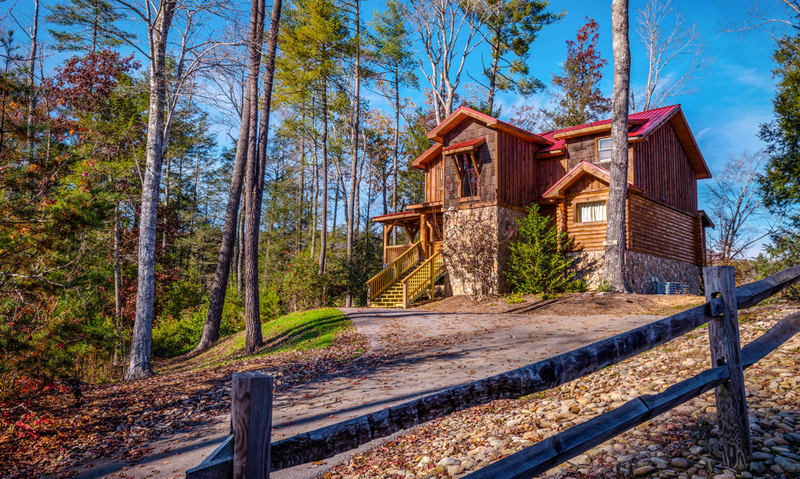 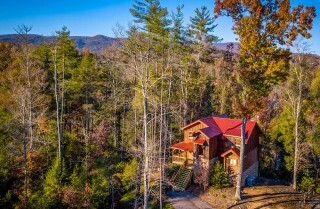 Located between Pigeon Forge and the Wears Valley entrance to the Great Smoky Mountains National Park, this 2,806-square-foot cabin rental offers spaces for 4 vehicles, allowing plenty of room and easy parking for the group. 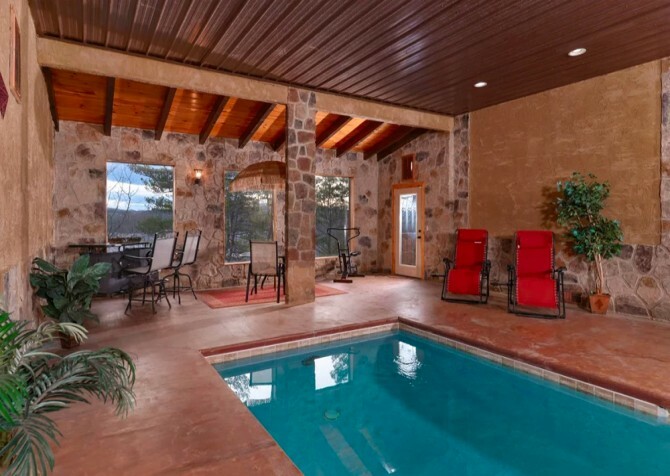 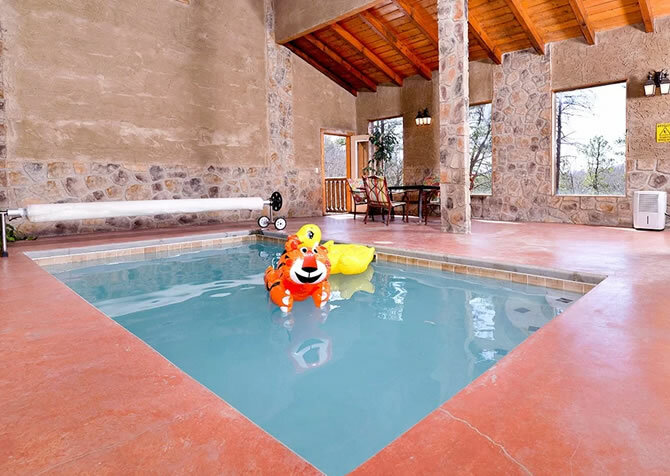 There are great amenities all throughout, but the showpiece of the cabin is the private indoor pool, where you’ll find a pool, wading pool, flowing fountain, big screen TV, and rustic stone walls. 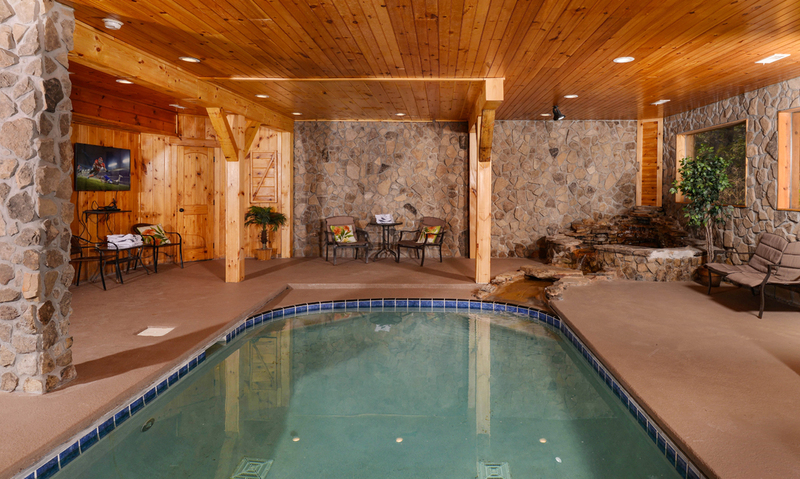 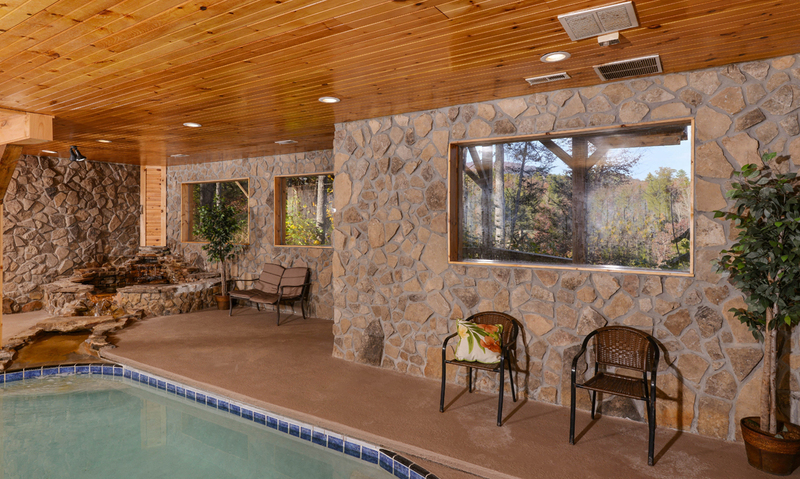 Swim and relax year-round in the spacious indoor pool room with wooded views. 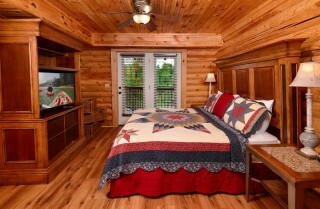 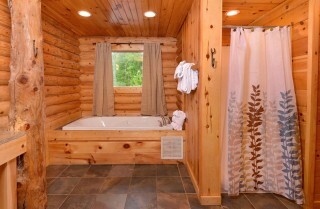 The cabin also has the conveniences you appreciate at home, making it both fun and comfortable while you’re away. 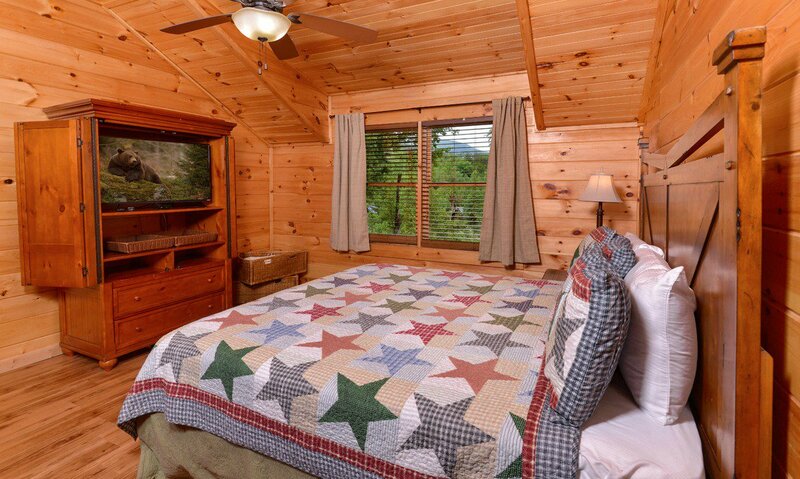 It boasts a washer/dryer, high-speed wireless internet, big screen TVs and DVD and Blu-ray players, a fully equipped kitchen, and more! 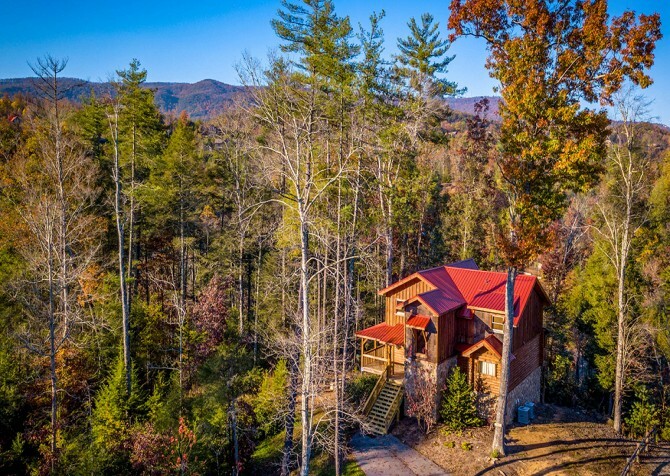 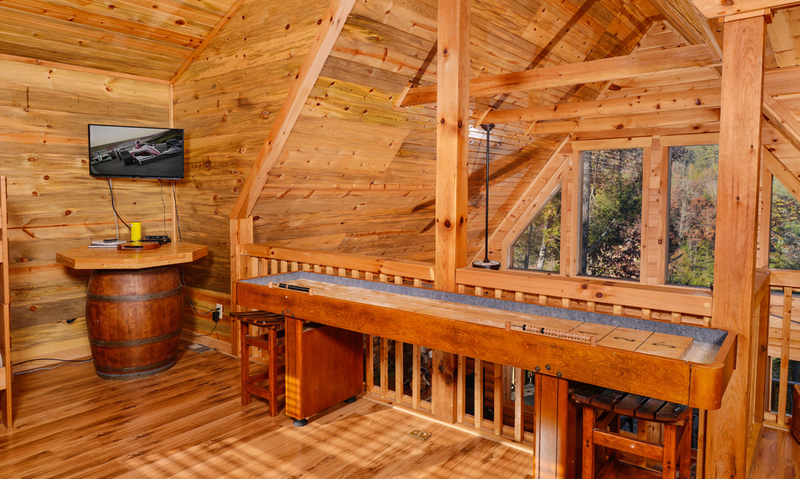 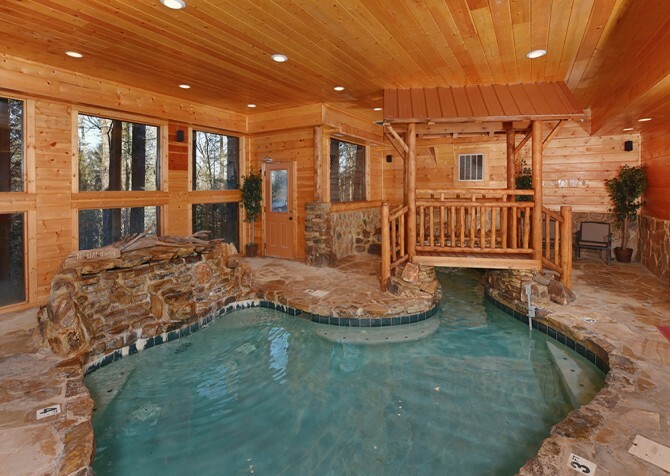 Each space was designed with fun and relaxation in mind, so you’re sure to have a memorable stay with family and friends in this beautiful Smoky Mountain cabin. 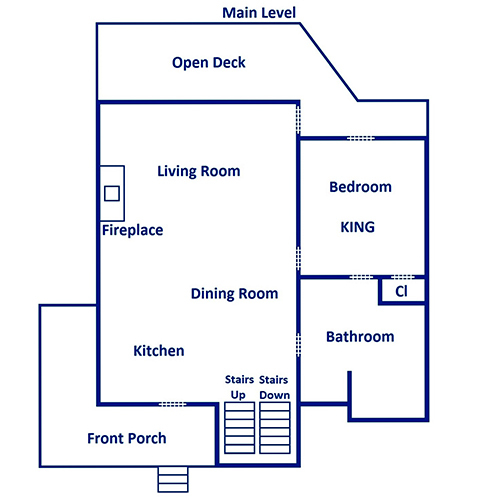 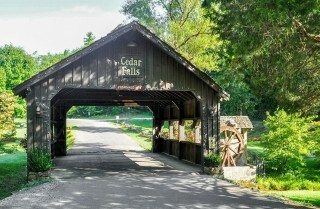 Saddle Creek also offers community perks with a location in the Cedar Falls cabin community. You’ll be greeted by a rustic covered bridge when you arrive, and you’ll have access to a nice playground and outdoor pool with seating and lush wooded surroundings! If you have kids coming on vacation, you won’t run out of things to do! 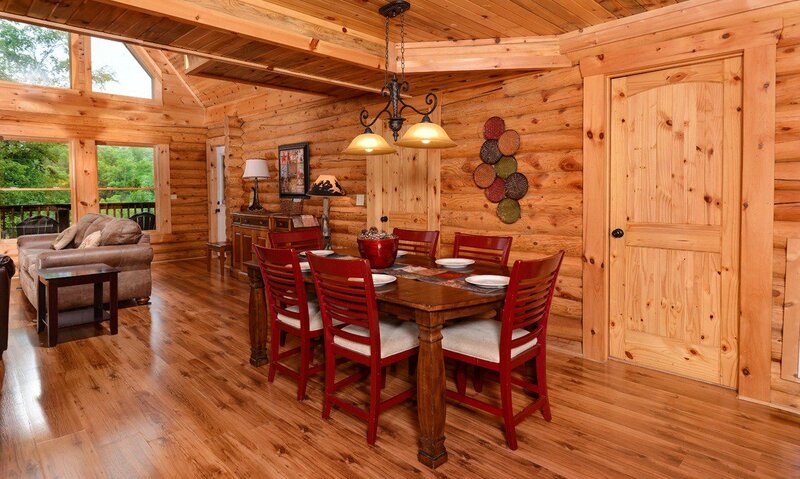 With a lodge-like feel and an inviting atmosphere, the living room of Saddle Creek is perfect for hot summer days, cool fall evenings, laid-back spring mornings, and cold winter nights. The beautiful fireplace features river rocks and log details, while the wood ceilings add a rustic touch to this elegant space. 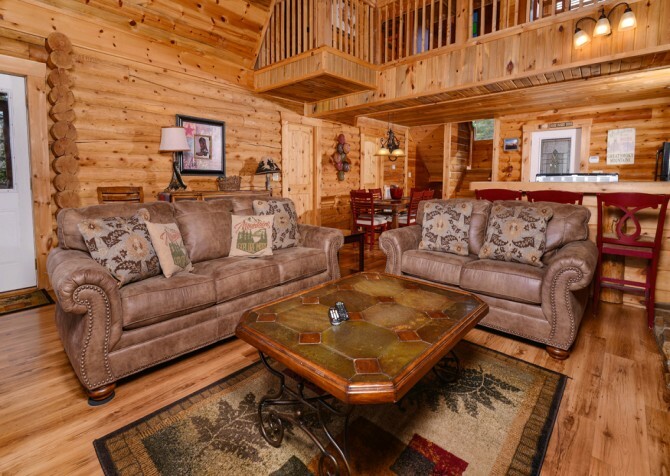 Cozy up on the plush sofas to relax, flip on the big screen HDTV to watch a ball game or late-night shows, or bring along board games and a few decks of cards to play on the large coffee table here. 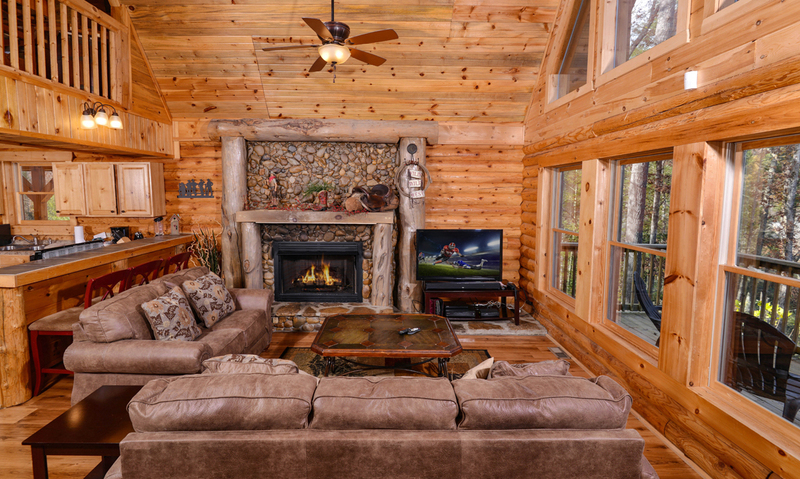 The TV even has DVR – don’t miss your favorite shows when you’re exploring downtown – Showtime, HBO, Starz, Cinemax, and a sport package! It’s a great place to hang out with family and friends, offering tree-lined views year-round. 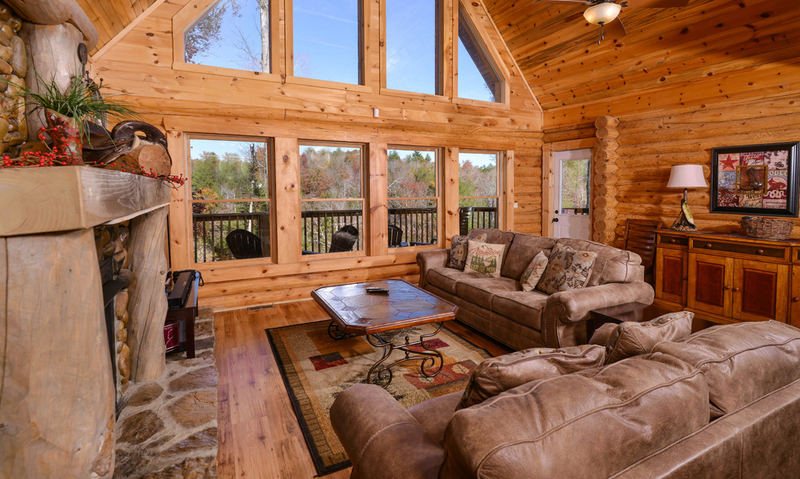 Windows stretch from floor to ceiling, so you’ll get lots of natural light streaming in. Gather with family and friends for fun days and cozy nights in the cabin! 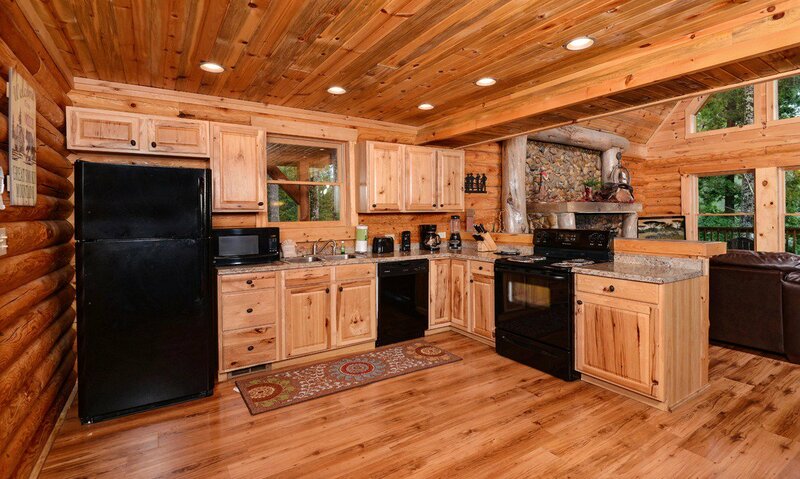 Bright and welcoming, the fully equipped kitchen features natural wood cabinets, light countertops, and sleek black appliances. You’ll have a full-size refrigerator, dishwasher, microwave, and stove/oven, along with plenty of counter space for prepping meals or setting out snacks. 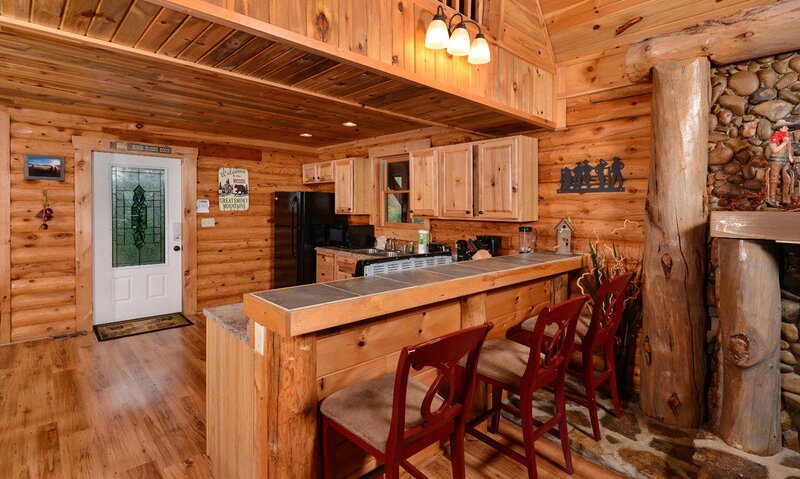 Other kitchen essentials like a coffeemaker, blender, toaster, and dishes and glassware make in-cabin meals a breeze. 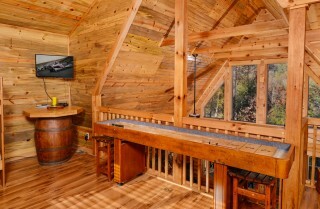 Plus, a breakfast bar offers seating for 3 and more room for drinks and snacks while you’re hanging out in the cabin. Sit down for in-cabin meals at the warm and welcoming table for 6 in the cabin. It features rich wood and red padded chairs, and with the breakfast bar seating, you’ll have room for everyone to enjoy meals together. You can make special holiday meals, romantic dinners for couples, and easy family-style meals in the comfort of your own cabin. Or you can just have a place to sit down for takeout pizza or leftovers after meals downtown. 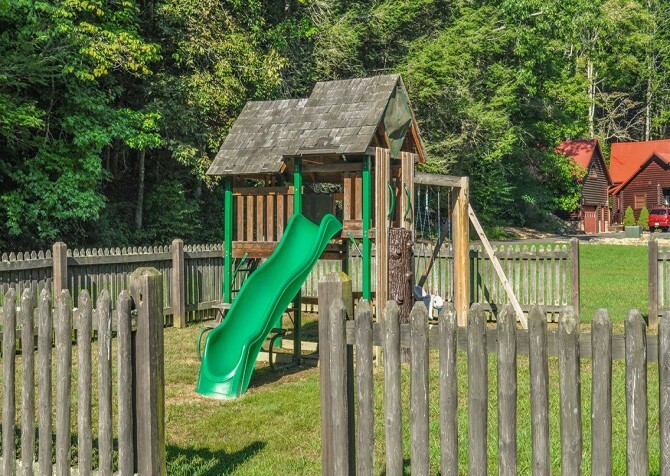 When it’s not mealtime, the table can serve as a game-night hub, with space to play cards and board games or let the kids color! Both bedrooms in Saddle Creek boast king-size beds, so they’re both comfortable retreats after busy days. 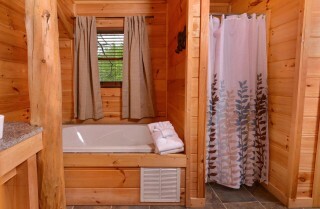 Each also has its own spa-like bathroom and creature comforts like nightstands and reading lamps. Located on separate floors, they offer plenty of privacy within the cabin. 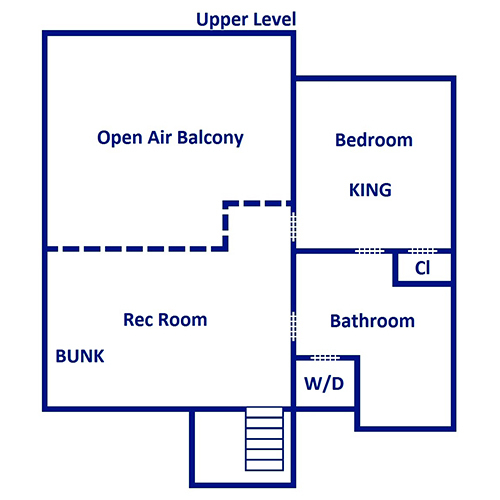 Beyond the bedrooms, you’ll have more sleeping space with the twin bunk bed in the loft and a sleeper sofa. 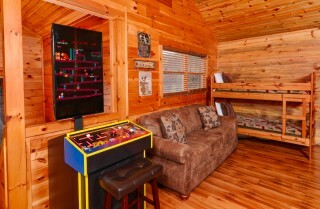 The loft is a perfect kids’ space, because it also serves as the rec room! Doubling as a third sleeping space, the rec room in the loft has plenty of fun for days around the cabin. 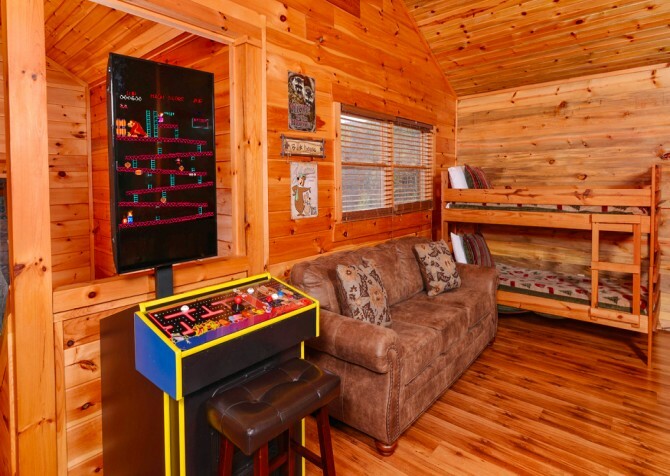 When you don’t feel like getting out to the arcades and attractions downtown, you can hang out in Saddle Creek. 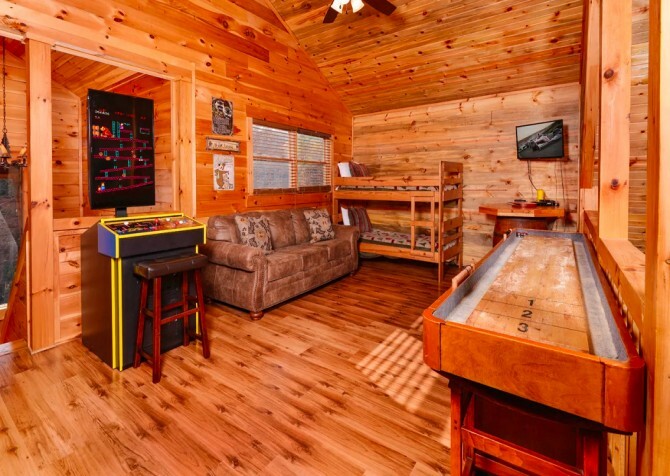 You can play shuffleboard and arcade games, bring cards to play at the pub-style table, or just watch TV on the flatscreen mounted in the corner. Recently renovated in early 2017, the private pool room features new tile and floors, a Diamond Brite-resurfaced pool, and new LED lights in the pool and ceiling! 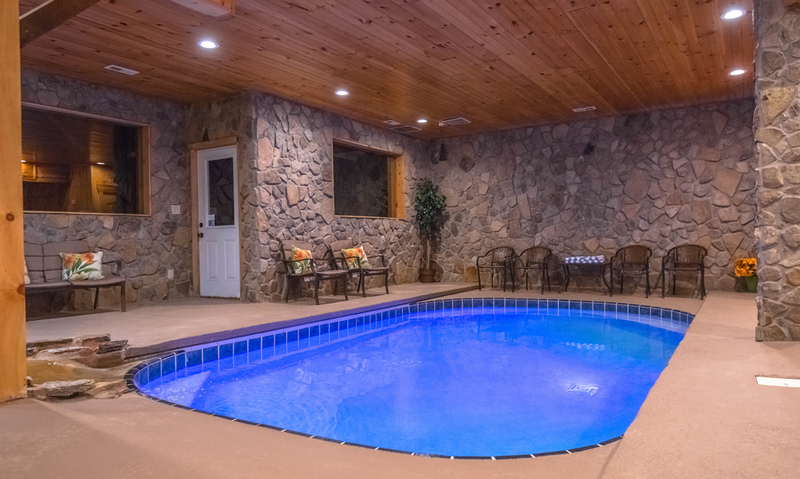 Maintained at a constant 87 degrees F with dual water heating systems for temperature reliability, the pool water is a comfortable temperature year-round. 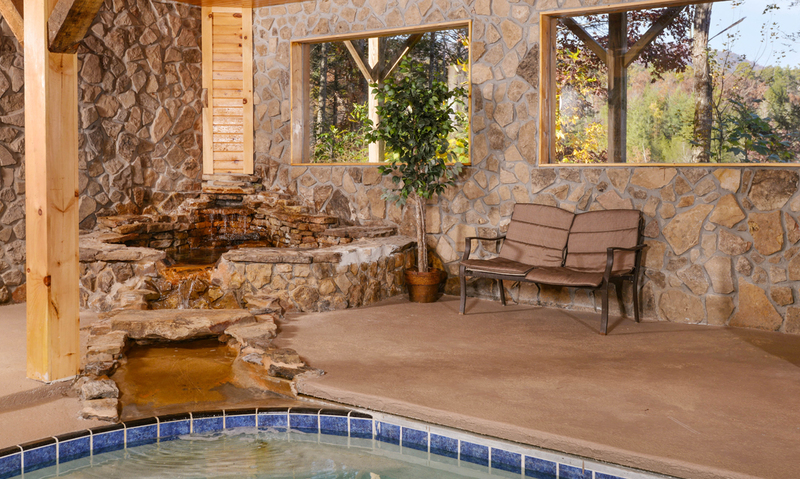 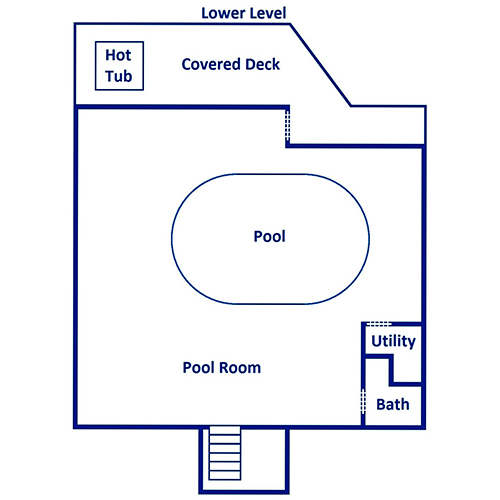 The indoor pool also features salt-generating chlorine, and a dehumidifier keeps the room comfortable as well. 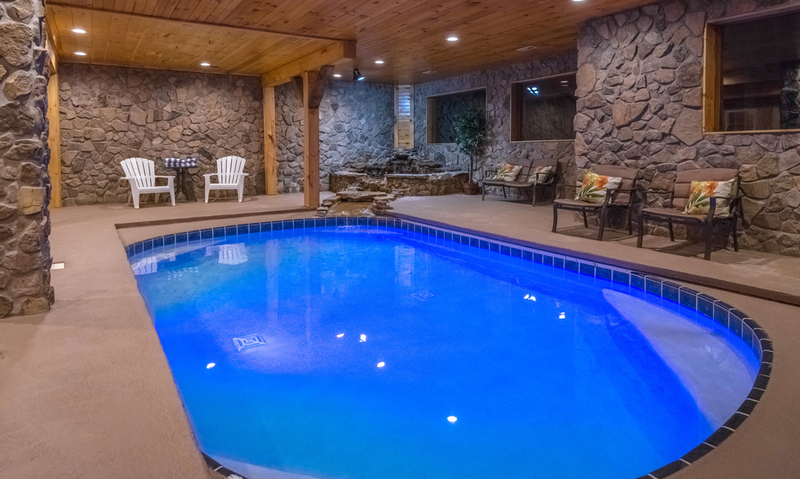 Enjoy a relaxing swim or just dangle your feet in the wading pool as the kids splash and play. 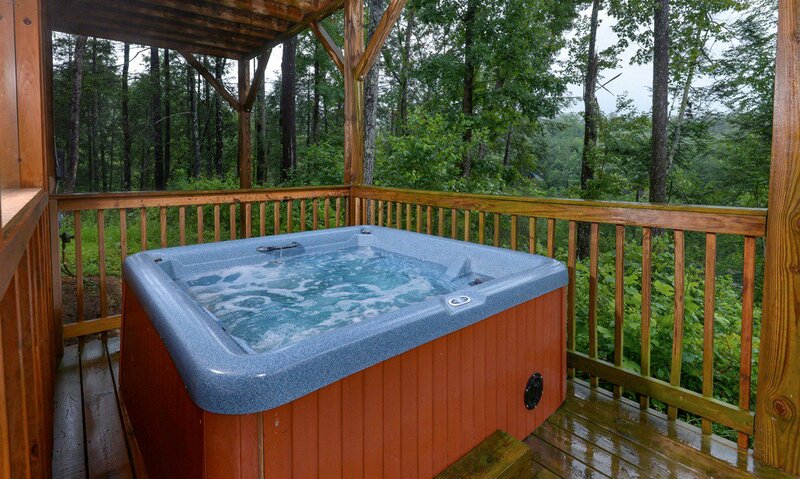 As you unwind, listen to the water cascading over the rocks, reminding you of the mountain stream where you had a picnic earlier in the day. If you just want to relax and watch, there are plenty of seating options around the room, from Adirondack-style chairs to a padded bench. The great outdoor spaces start when you pull into the paved driveway of Saddle Creek, where you’re greeted by beautiful trees and a gorgeous stone-and-log exterior. 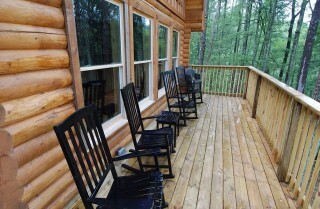 Then you’ll have more great outdoor time on the decks, where you’ll find a hot tub and rocking chairs. 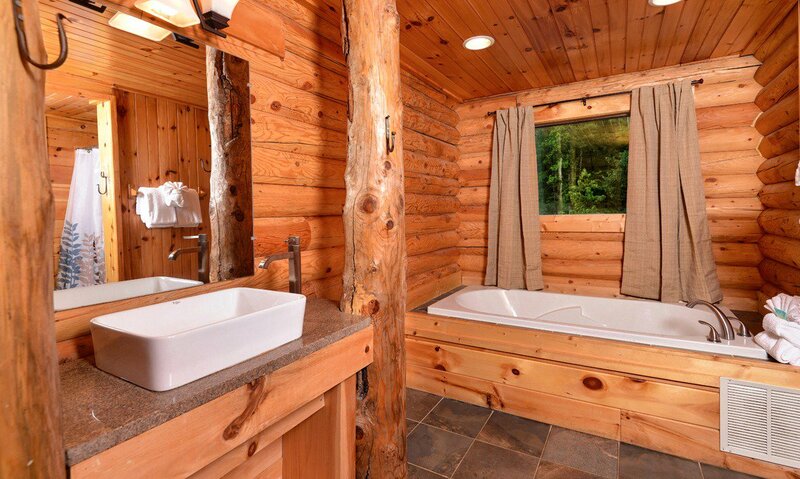 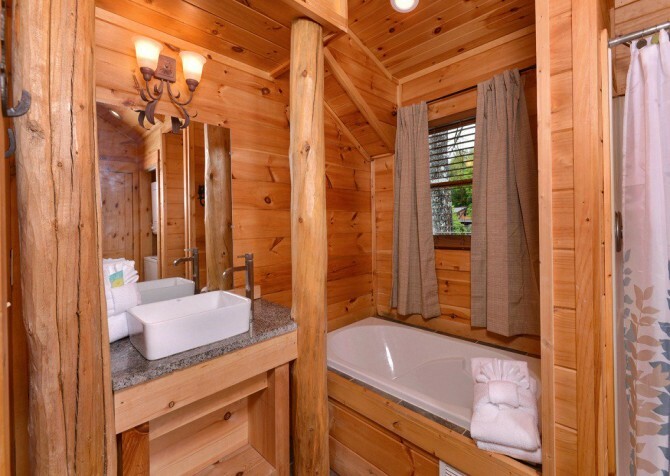 Climb in for a soothing soak to enjoy the serenity of the Smoky Mountains, grab a book and a drink and relax in the rocking chairs overlooking the trees, or just start your morning with some fresh air and a cup of coffee on the deck. You can pack light when you head to Saddle Creek, where you’ll have a washer/dryer in the cabin. 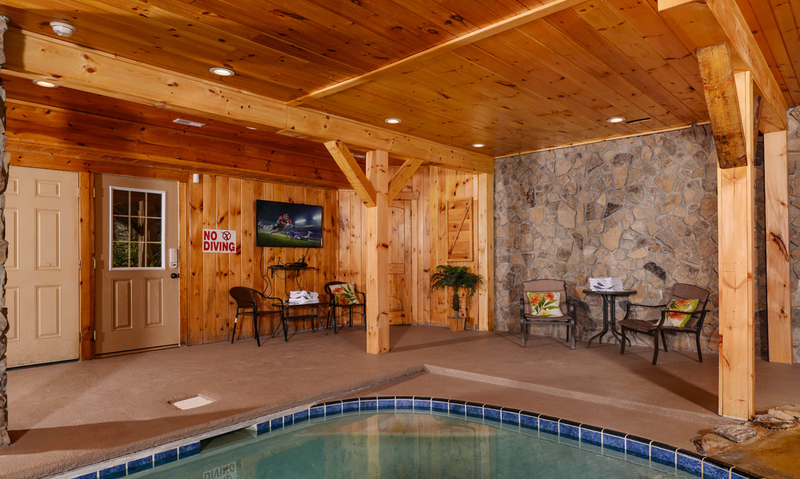 You’ll also have high-speed wireless internet, so you can stream your favorite shows, check emails, buy attraction tickets online, or see what events are going on during your stay. 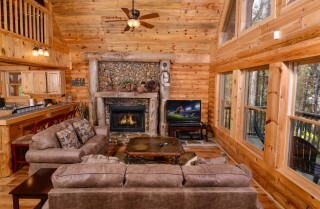 And don’t forget your favorite foods for the charcoal grill and your favorite movies for the Blu-ray and DVD players! Fly along at your own speed on the Smoky Mountain Alpine Coaster, where you’ll get up-close views of the Smokies during a thrilling ride! This all-in-one attraction is fun for all ages, offering mini golf, laser tag, go karts, and more! The Island is an awesome blend of shopping, dining, and entertainment. 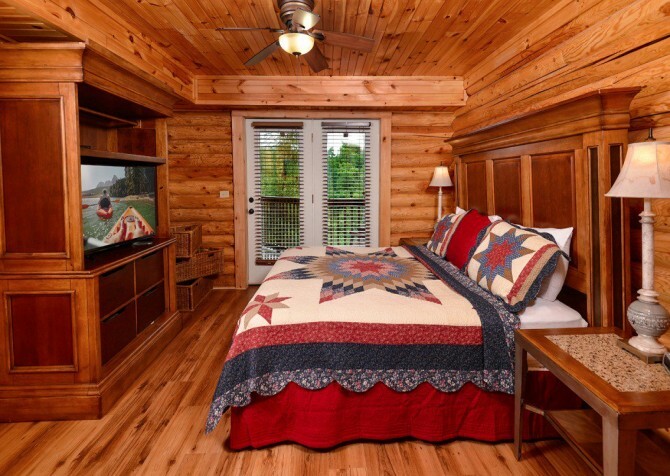 In the heart of Pigeon Forge, it boasts the Great Smoky Mountain Wheel, The Escape Game, Margaritaville, Paula Deen’s Family Kitchen, a ropes course, The Island Show Fountain, Ole Smoky Moonshine, boutique stores, and so much more!